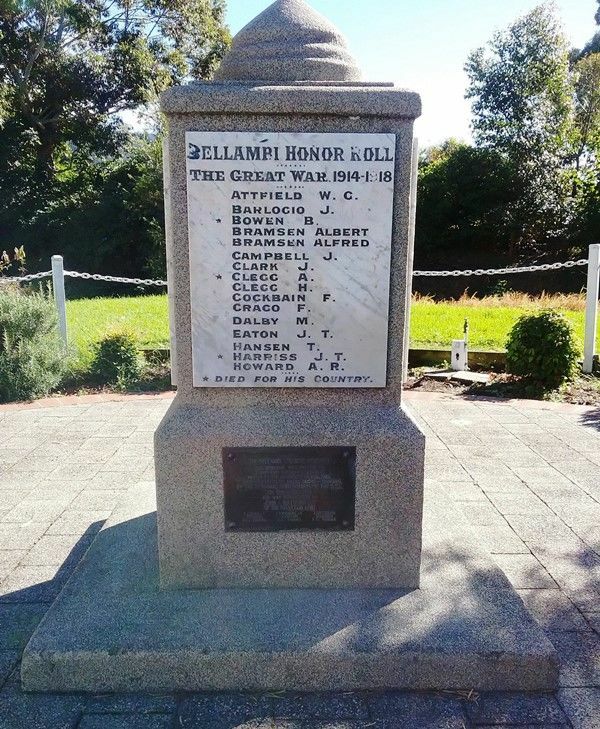 A monument commemorates those from Bellambi and District who served in World War One. It was relocated to Corrimal from the Bellambi Railway Station and rededicated in 1992. A striking memorial to the Bellambi men that laid down their lives in the great war, and their comrades that fought, but returned, was unveiled on the Bellambi station on Sunday last in the presence of a gathering a citizens representative of the district, and of representatives of the branches of the Returned Soldiers' Association. Prior to the opening ceremony patriotic airs were rendered by the Corrimal Town Band, under the baton of Mr. Simons. 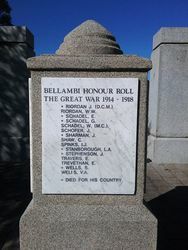 Mr. P. C. Pryor, president of the Memorial Committee, said they had gathered to do honour in some slight way to the soldiers that had enlisted from Bellambi during the Great War. He was very gratified at the assemblage present, particularly so for the presence of the member of their district, and their Premier (Sir George Fuller), Capt. Sir Frederick Waley, and Mr Mark Morton, M.L.A. The Memorial was the result of the collective efforts of the residents of Bellambi, and the monument, as it stood, was free of debts. A total of 45 names were on the roll, and of that number 11 had paid the Supremo Sacrifice. Mr Pryor spoke of the first enlistments from Bellambi in November, 1914. These were two boys who had been educated side by side, worked together in South Bulli Colliery, and enlisted together. But one had not returned. Both had gained distinction. One had been awarded the D.C.M., whilo the other had gained his captaincy and the Military Cross. It would stand to the credit of Bellambi that not one soldier that had enlisted from Bellambi had gone without a farewell or without a welcome on return. Mr. Pryor next called upon the Premier to perform the unveiling ceremony. Before doing so, Sir George said he had been invited to be present at the simple, yet very solemn ceremony of the unveiling of the monument to the boys of Bellambi who left during the years of 1914-18. He hoped they would never be forgotten. Excerpt from Illawarra Mercury (Wollongong, NSW), 4 April 1924. 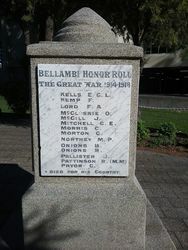 This Memorial Was Erected On Bellambi Railway Station In 1924 By The Residents Of Bellambi. 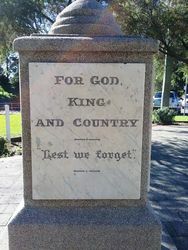 It Was Relocated to ANZAC Grove - Corrimal By The Corrimal Sub-Branch Of The RSL On 12th April 1992 And Was Rededicated By John S.Matthews J.P Of The Salvation Army.